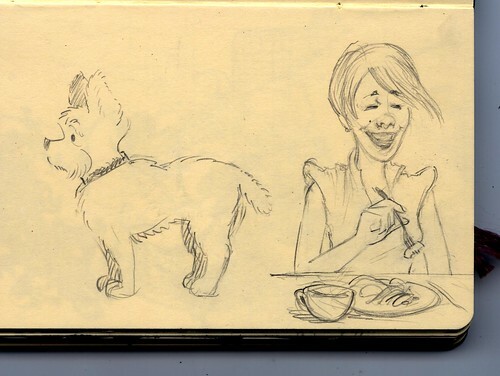 I was having lunch outside at Bloom Café last week, when I sketched these two. She was lunching with friends while her pup trotted around on the sidewalk all around and under the table. The drawing might be a little confusing, but the dog was not standing on the table. Also, he was about half the size shown here in relation to her. I don’t know much about dogs, so I can’t tell you what breed he is. Maybe you know? At any rate, he was damn cute.